On September 30th, a one-week-old Sea Otter pup was found stranded on Coastways Beach in California. She was rescued by the combined efforts of the California Department of Fish and Wildlife and Monterey Bay Aquarium's Sea Otters Program. At the time of rescue, the pup had been separated from her mother for at least 16 hours. The pup spent four weeks under the 24/7 care of the scientists of the Sea Otters Program. 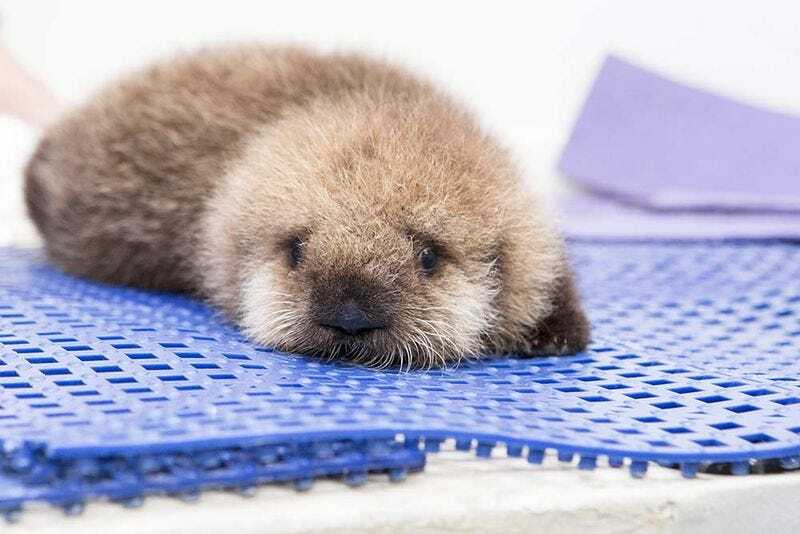 There are very few facilities that are set up to give the kind of care that a vulnerable young Sea Otter pup needs, but this pup thrived and has now been transferred to the Shedd Aquarium as part of a 30-year effort to rescue every distressed sea otter that is discovered along the coast of California. To date, this effort has assisted almost 700 Sea Otters. This little pup is currently referred to as "Pup 681," and her new home at Shedd Aquarium includes round-the-clock care and attention from the devoted aquarium staff. Shedd Aquarium became a leader in Sea Otter rehabilitation after the 1989 Exxon Valdez oil spill, during which many pups were orphaned. The purple foam thingies that you see in some of the pictures mimics the long strands that make up the kelp forests where Sea Otters spend much of their time. They use the strands to anchor themselves for rest periods, to keep from floating away. Sea Otters use the water to help them regulate their body temperature, which is part of the reason that it's critical for orphaned pups to have 24/7 care. The attendants help the pup to regulate their body temperature by helping them in and out of the water.